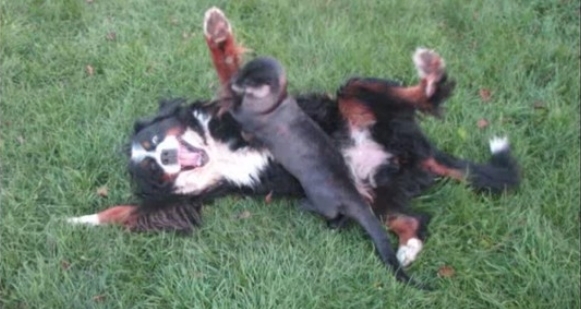 Bernese Mountain Dogs and otters are cute and loveable on their own - watch them play together to see some serious cuteness! Two soulmates have found each other at last: one from the water, one from the land. A Bernese Mountain Dog will be your friend for life. Self-confident, alert and good-natured, be sure to socialize well as a puppy. These dogs are slow to mature, acting like puppies longer than other breeds. They are rather friendly with strangers, and are generally good with other pets and dogs. Responses to "Bernese Mountain Dog and River Otter play together"